If you’re looking to buy a French Press coffee maker, one of the top models you’ll encounter in your search is bound to be this attractive little number by the folks at Brillante, which is made from high quality German-made glass beaker and a highly efficient double-mesh filter. Brillante is a company that is known for its stylish coffee brewing solutions, and perhaps the most popular brewing solution – their Small French Press – has come to our attention and we are ready to divulge its secrets. One of the main features we enjoy, as do many fans of the Brillante Small French Press, is the clever double mesh system they’ve devised here. With ordinary French Press coffee makers, you get the mesh that is used with the plunger, and that alone is meant to prevent grinds from getting into your coffee and give you a smooth cup. However, this isn’t always what happens and, although you might get a tasty cup of coffee from another type of French Press, sometimes they turn out grittier than expected. In the coffee world, gritty coffee is a top complaint, which is why we really do appreciate the double mesh system, as it eliminates any chance for stray grinds to end up in your cup of coffee. The same thing goes for tea. This Brillante double mesh system strains your coffee or tea very effectively, leaving you with with nothing but smooth, delicious coffee in your favorite mug. This is one big reason we think that the Brillante Small French Press is currently doing so well in terms of reviews online. Another cool feature of the Brillante Small French Press here is the fact that it uses a heavy, heat-resistant polypropylene glass, combined with a stainless steel lid. The black plastic handle is ergonomic so its easy to take hold of (there are grips on the handle) and there is plenty of space so your hand won’t come into contact with the glass. So, in addition to being both functional and durable, the Brillante Small French Press is also very pleasing to the eye, and it all adds up to this being a very nice little package. As we always mention when talking about the French Press, having the best coffee grinder for your French Press can go a long way towards brewing the perfect cup of coffee. If you use the right coffee grinder for your chosen brewing method, your cup of coffee will end up tasting that much better than if you just use pre-ground coffee beans. 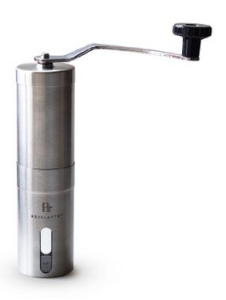 With a French Press coffee maker like the Brillante here, there are two reasons we would suggest you make sure you get the right grinder for the job. Firstly, if you get yourself a good hand crank coffee mill, many of them are designed to grind straight into your Brillante Small French Press. Specifically, the best coffee mill you can get for your Brillante Small French Press is its counterpart, the Brillante Manual BR-MCG-SS1 Coffee Mill. These two products were actually made to go together, so if you were to buy a coffee mill to go with your Brillante Small French Press, this would be the ultimate pairing. While using a French Press is often associated with taking our sweet time, this brewing method is actually one of the simpler and quicker ways to make coffee, not to mention easy to clean. This is why owning a French Press like the Brillante actually lends itself well to travel mugs like this one here by Thermos. The Brillante French Press makes 12 oz of coffee, which is a great one-mug or single serve amount, and perfect for pouring into a travel mug (we review it here) and heading out the door. The Thermos travel mug here is a top of the line model and many people opt to buy these two things together as they do compliment each other very well. Whether you’re going to work or going on vacation, the Brillante Small French Press is your one-cup brewing solution, quick and easy. One big plus for the Brillante Small French Press is its dishwasher friendliness. Because of the thick German glass and well-made parts, its very convenient that you can add this to your dish load and have it spick and span in no time. At the same time, manual cleaning of this French Press is extremely simple. There aren’t many parts to deal with, and the one which will require some wiping down is made of glass and so easy enough to reach in and clean it quickly. Just use a bit of soap, water, and TLC and you’re good to go again! Yes, while the Brillante Small French Press is only 12 oz and meant as more of a single serve, you can size up to something like the KONA French Press if you’re looking for a bigger French Press, at 34 oz. Yes, while people do seem to love it, it does have plastic parts. This should have been fairly obvious by now, but not everyone likes plastic coming into contact with their beverage. Some pickier coffee drinkers say it affects the flavor. 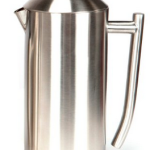 The Frieling Stainless Steel French Press, on the other hand, is made from 100% stainless steel. 3. It isn’t the fastest way to make coffee…you might have to wait a minute or two. Its true, there are faster ways to brew coffee. We said that making coffee with your Brillante Small French Press goes relatively quickly, but not blindingly fast, as some other coffee makers do. If you feel the need for brewing speed, check out the Mr. Coffee BVMC-SJX33GT 12-Cup Programmable Coffee Maker. For home brewing purposes, not only is the Brillante Small French Press a great inexpensive option compared to other coffee makers, but it saves on power to. Hot water is really all you need to make this thing work, and for some people, that’s something they would prefer is a non-electrical option like this. On top of that, you get a great, super smooth cup of coffee thanks to the double mesh. 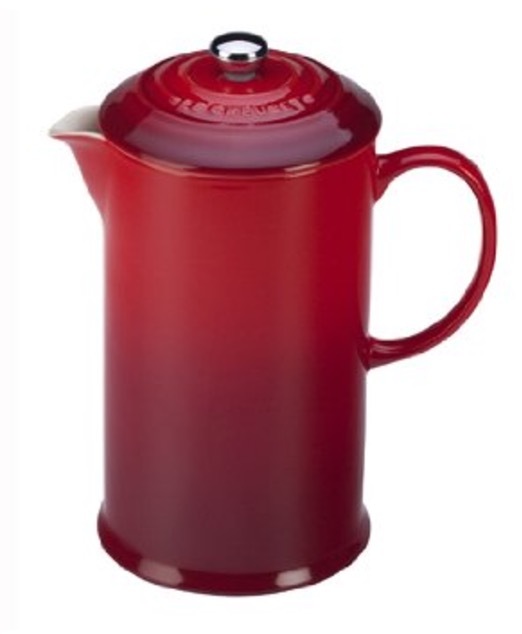 The Brillante Small French Press is simplicity itself. 5 STARS! 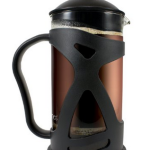 We Review The Best French Press Coffee Makers to Truly Impress! 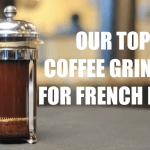 We Review the Best Coffee Grinder For French Press!